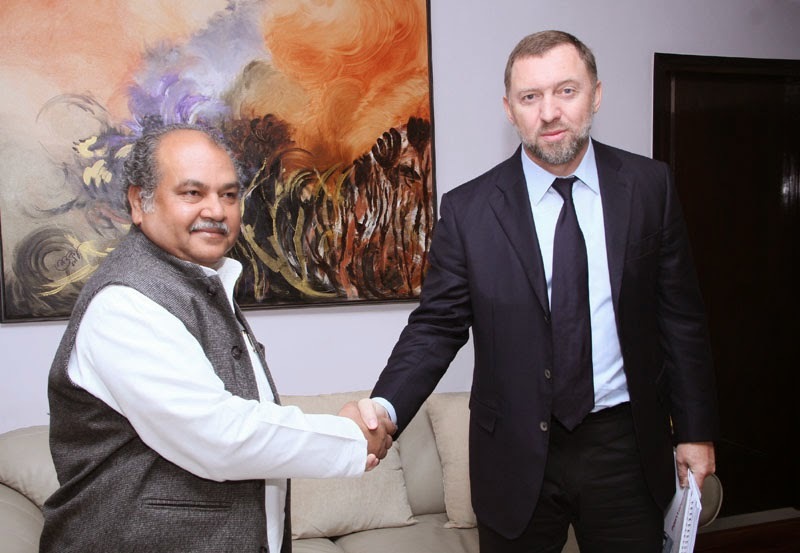 The Union Minister for Mines and Steel, Shri Narendra Singh Tomar meeting the Chairman of the Supervisory Board of the Russian mining and metals company Basic Element, Mr. Oleg Deripaska, in New Delhi on December 12, 2014. Chairman of the Supervisory Board of the Russian mining and metals company Basic Element, Mr Oleg Deripaska called on the Union Minister of Steel and Mines Shri Narendra Singh Tomar on December 12, 2014, to explore partnership potential in developing Bauxite related sector in India. Attached with Russian President Mr Vladimir Putin’s visit to India, Basic Element is the leading player in the fields of metal, mining, hydropower and nuclear energy in Russia. Shri Tomar welcomed the interest evinced by the group, and apprised them of the initiatives being taken by Indian government to improve transparency and simplify procedures to aid global investment and knowledge-sharing. Mr Oleg Deripaska responded that he would return with a project plan to this effect, after studying the legal and operational framework of Indian economy. Joint Secretary, Ministry of Mines, Shri Arun Kumar, was also present on the occasion. Union Tribal affairs Minister Shri Jual Oram has said that efforts should be made to bridge the gap of economic and social development between tribals and non tribals in the country .Speaking at the daylong brainstorming consultation on convergence of resources for tribal development held here today the Minister said issues like gainful employment, quality education, health facilities and availability of safe drinking water are very important in terms of the development of tribals. He urged the participants to give their suggestion with an open mind. The day long consultation was attended by senior officials from the Union Ministries of Rural Development, Health and Family Welfare, Culture , HRD, Drinking Water and Sanitation, Agriculture and various states and NGOs. Issues such as feasibilities of convergence of activities, funds and resources with key stakeholders, requisite timelines for effective implementation of programmes, issues and challenges in achieving the intended convergence, opportunities to overcome the constraints, model strategic framework for management of resources and innovative / corrective measures to be incorporated in the existing guidelines to address the critical missing links were discussed. Both Central Government and State Governments have taken various initiatives for development of tribal people in the past. However, the human development indices for tribal population is not showing expected trend in general over the years at par with other social groups. The indicators in respect of health, education, livelihood, women empowerment, access to drinking water etc. are alarmingly low, as per the figures reflected in Census 2011. Further, preservation, protection and promotion of their rich cultural and traditional heritage calls for special attention. Funds for tribal development are sourced from (i) State Plans; (ii) Funds under TSP components of Centrally Sponsored Schemes (CSS) administered by Central Ministries/ Departments; (iii) Special Central Assistance to Tribal Sub Plan (SCA to TSP), Grant under Article 275 (1) of the Constitution and other schemes implemented by Ministry of Tribal Affairs; and (iv) Institutional Finance. It may be mentioned that total tribal population in the country is 10.5 crore approx, which is about 8.6 percent of the total population. As such, on an average per capita availability of fund per year for tribal development comes out to be about Rs. 10,000/-. Evidently, the availability of funds is not the real constraints in achieving the intended targets. Instead, somewhere the resource mobilization and effective management thereof appears to be an issue of concern. After going through in details into the recommendations of the Group of Secretaries the Union Minister for Water Resources, River Development and Ganga Rejuvination Sushri Uma Bharti has finalized a Ganga Rejuvination Programme which will have three groups, seven objectives and 21points. The committee of senior officials of the Ministry and consortiums of seven IITs constituted to ensure uninterrupted flow of Ganga will submit its final report by the month end. The Minister has directed Central Water Commission( CWC) to prepare plans for the construction of reservoirs along Ganga,Yamuna and its tributaries to ensure sufficient water in these rivers during non monsoon season. To ensure cleanness of Ganga and Yamuna , 41 teams of CWC experts visited several places to assess the impact of open drains falling into these rives and status of Sewage Treatment Plants ( STPs). Three expert teams were constituted to suggest measures for setting up of new STPs and modernization of existing STPs. These committees have so far examined 18 major suggestions. For riverfront development and beautification of ghats, DPRs have been prepared for two such ghats at Delhi and Haridwar. Very soon final decision will be taken for development of ghats in Mathura, Vrindavan and other places in PPP mode. It has also been decided to constitute Ganga Task Force to ensure proper implementation of Ganga rejuvenation programme. Ministry of Defence will provide manpower for this.